Update, Saturday, Nov. 11, via FUREE, Families United For Economic Equality activist group: Gowanus Houses cannot catch a break. After being left without power for 10 days after Hurricane Sandy, and forgotten by most everyone while all the focus went to waterfront areas, a water main has broken at the Gowanus Houses along Hoyt Street, between Carroll Gardens and Boerum Hill, leaving thousands of residents in eight of 14 buildings there again without access to clean water. Volunteers and donations of water (to flush toilets, cook and bathe with), are being requested at the Gowanus Community Center, at 420 Batltic Street. Volunteers are needed until 6 p.m. Saturday. Hot food is also appreciated. For more updates, check out: http://www.facebook.com/FUREEous, and http://furee.org/news/alerts/solidarity-after-sandy. Update: Friday, Nov. 9 — The power is back on in the Gowanus Houses, low-income housing on the edge of Carroll Gardens. Wednesday, Nov. 7 — It’s snowing, and cold. On the Wednesday after Election Day, hundreds of families living in five Gowanus Houses low-income public housing buildings are without power for the ninth day in a row, after Hurricane Sandy flooded basements and shorted out electrical wiring. The situation in the Gowanus Houses is getting dire. According to the PTA president at PS 32 Elementary School in Carroll Gardens, where the kids of the Gowanus Houses attend school, there is an urgent need for prepared food and water in the buildings. Kids are cold, hungry and frightened, and many of the thousands of apartments are without running water — meaning no showers, no flushing toilets. Indeed, nerves are frayed in the Gowanus Houses, where some residents are suffering with no electricity, sporadic and dirty water, and little-to-no heat. Sunday night was the first night they had a little heat, she said. 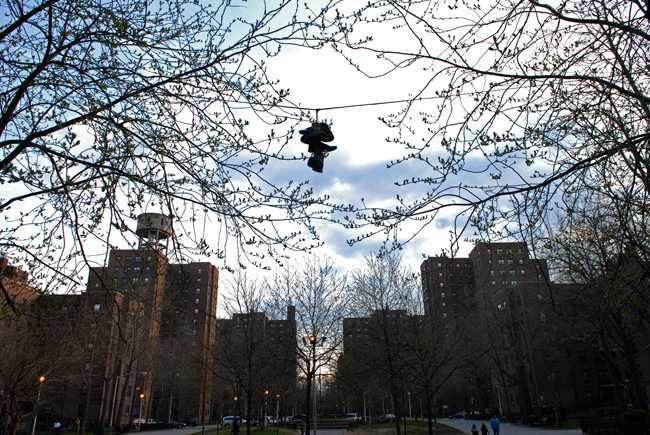 Few thought this New York City Housing Authority development faced danger from the hurricane’s surges; unlike the Red Hook Houses and Brooklyn beachfront neighborhoods, it sits far from the New York Harbor and the Atlantic Ocean. But when the Gowanus Canal overflowed during the storm, its heavily polluted saltwater corroded two manholes covers and flooded basements in the development, damaging electrical lines and fuses. Donations are rolling in for Gowanus Houses. But needs are great. City Councilmember Stephen Levin has been pressuring Con Edison and NYCHA to restore power. Conceding that the Housing Authority has had to deal with power outages in many of its buildings, he still faults the agency for their slow response. “I believe that they haven’t seen Gowanus as a priority,” said Levin, who represents Park Slope and Boerum Hill. “Con Ed is ready to go,” he said, but NYCHA has been slow to send in teams of electricians to repair and certify the waterlogged systems. The agency said they expect power to be back by Wednesday, Nov. 7, but Levin is skeptical. Life has been difficult for those who live in the housing project, who say they’re cold, scared at night in the dark, and sick of not being able to shower. The senior resident, who did not want to give her name, said that when schools finally reopened on Monday, her daughter did not send her grandchildren because they had not been able to bathe all week. Meanwhile, volunteers have been steadily donating supplies and their time, sorting items and going door-to-door to check on residents—particularly the elderly and moms with infants. Valery Jean, executive director of Brooklyn-based Families United for Racial Equality and Economic Equality (FUREE), has been leading the volunteer efforts there since Friday, Nov. 2, when the development’s tenant association president reached out to her. Before that, local volunteers had been directing their efforts elsewhere. Many Carroll Gardens residents said they were unaware of the need at the Gowanus Houses until recently. Andrew Rosenberg, 43, said the first he’d heard of the situation was when he was heading to Red Hook with bags of supplies last week. “I ran into someone, and he said, ‘Are you going to Gowanus?’” Rosenberg said. He redirected his volunteer efforts to the Gowanus Houses on Monday, Nov. 5. 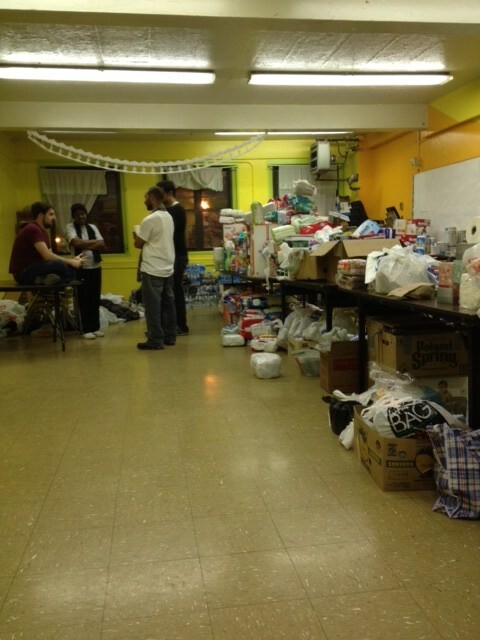 Though the volunteer effort may have been slow to start, the Gowanus Community Center on Baltic is now filled with canned goods, diapers, blankets, and clothes. “The outpouring of support has been extraordinary,” Levin said. FUREE workers say they need 300 percent more than what they’ve already received in donations to ensure that residents are safe and well fed through the snow storm starting Wednesday. High on the list of needed items are baby food, ready-made formula, flashlights, batteries, gloves, and socks. For more information or to volunteer, visit FUREE. Meanwhile, the elementary school PTA leader, Bailiff, said PS 32 is accepting supplies and donations, including diapers and formula, but especially water and food. Bring donations to the school lobby on Hoyt, between Union and President. Or email PS32@pta.org. Cash is also being accepted to buy food in bulk.